A decade ago, the thorp of Sunset Valley was a quiet, sleepy place. The discovery of gold in the surrounding hills changed all that, however, and made its finder rich overnight. But Boss Corl, as he is now known, is a greedy man and ruthlessly controls the flow of gold into and out of the now re-named village, Golden Valley. Such sudden wealth brought an influx of miners, adventurers and treasure hunters into the village and prices skyrocketed. Now, new miners must work for years just to pay off the cost of their equipment and prices for even the most basic of commodities are extortionate. Recently, it has become apparent to Boss Corl that the gold supply is fast running out. Desperate for more, Corl has pushed his workers to even greater efforts and accidents and deaths are becoming commonplace. Rumours have even started to circulate of foul, sightless things living in the deepest caverns that haul off lone miners to gruesome fates. 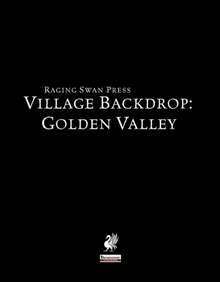 Village Backdrops are short, richly detailed supplements that each present a single village ready to insert into almost any home campaign. Perfect for use as a waystop on the road to adventure, as an adventure site themselves or as PC’s home, Village Backdrop present the details so the busy GM can focus on crafting exciting, compelling adventures. This product is a Dual Format PDF.The downloadable ZIP file contains two versions, one optimised for printing and use on a normal computer and one optimised for use on a mobile device such as an iPad.